In response to the December 2016 East Huntspill Housing Needs Survey (which identified the need for 14 new affordable homes for local people), the Parish Council have been working with Sedgemoor District Council’s Affordable Housing Development Team (AFHDT) to investigate potential development opportunities capable of addressing this need. The Parish Council are keen to see new affordable homes built that will help local people to access a suitable home, at a price they can afford where they were born / grew-up / have support, social networks or work in. The Parish Council are delighted the family below, with such strong connections to the village were chosen to take part in these events. Ryan's children Riley and Finley are the 6th generation to live in the village and I believe Tanya his wife has lived here most of her life. Ryan's Great, G.G.G.G Grandad attended the local school which is now the Church Hall. All six generations have attended the village school. The family settled at Cornmoor Farm in the 1800's and to this day the farm still remains with in the family. Ryan's Great Grand father hit the headlines during the war, whilst working in his fields he noticed a German plane coming down which then crashed close to the river bank. With no more a do he grabbed his gun jumped on his horse and galloped over to the pilot, two neighbouring farmers saw what was happening and followed Jack Baker thinking he might shoot the German, this did not happen but they did capture him. 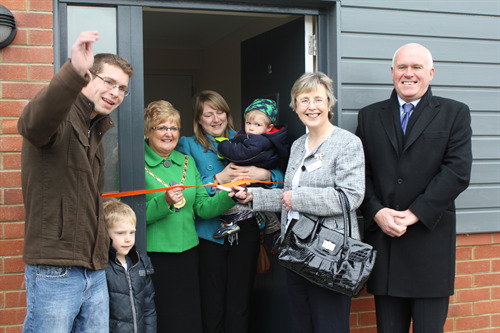 Raglan Housing Association is pleased to announce the completion of three new affordable homes to rent in East Huntspill. 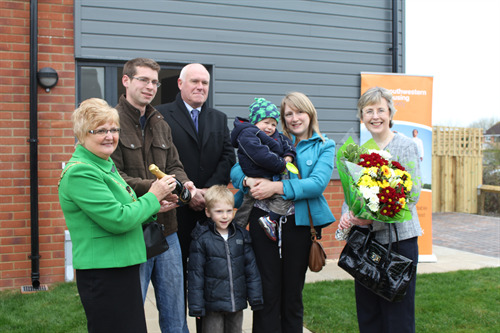 The scheme consists of two three bed houses and one four bed house at Mercia Close. This rural exception scheme was formally agricultural land known as Smithy Farm and the properties benefit from great views of the surrounding landscape. The scheme was built in conjunction with contractors, Hammonds Yates Partnership, who previously worked successfully with Raglan on Worston Road in Highbridge. The homes achieve Code for Sustainable Homes Level 3 and benefit from external air source heat pumps to each property. This provides heating and hot water due to the lack of gas mains in the village. The scheme took eight months to construct and was handed over on 14 November 2011 with the new tenants moving in shortly after. The houses have been allocated through Sedgemoor District Councils Choice Based Lettings to residents with a local connection to the area. It all started in 2008 with the Parish Council initiating a housing needs survey to be undertaken throughout the parish. Then armed with a proven housing need the Parish Council took on board the process of providing affordable housing for local people. This was followed by a public consultation day and now here we have a development of 12 new properties for rent being built on land acquired at Hackness Farm, previously owned by Somerset County Council. South Western Housing Society, in partnership with East Huntspill Parish Council and Sedgemoor District Council are building 5 x 3 bedroomed houses, 5 x 2 bedroomed houses and 2 x 2 bedroomed flats for rent by people who have a strong local connection to East Huntspill. Kier Homes were appointed to build the properties which are all being built to Code Level 4 standard, which means that they will benefit from the latest energy efficiency technology, including solar panels (for heating water), a mechanical ventilation heat recovery unit and sanitary fittings to reduce water usage. All the homes have low energy fittings throughout, full filled cavity wall insulation; 400mm loft insulation and double glazing, making them as cheap as possible to run whilst being environmentally friendly. The properties are owned and will be managed by South Western Housing Society who are in the process of relocating their offices locally to Rooksbridge. The properties will be advertised on Homefinder Somerset from early on in the New Year – it is therefore important for you to ensure that your housing application is fully updated in particular with your local connection details and any addition to your family. It is essential that you check the adverts regularly in the property advertisement section. If you wish to discuss your housing options, need help in completing an application form or require information on choice based lettings, please contact Sedgemoor District Council’s Housing Advice Team by email housing.advice@sedgemoor.gov.uk or phone 0845 408 2540. There is a small development of 3 affordable homes for rent through Raglan Housing Association to the rear of the Bellway site at Smithy Farm. Affordable housing is for people who are unable to rent or buy on the open market. This includes rented housing, shared ownership, equity loans and low cost home ownership products. Affordable rented homes are provided by both the Council (Homes in Sedgemoor) and Registered Providers (Housing Associations), or in some cases by private landlords who charge rent below that charged on the open market. These homes are ideal if you do not want to, or are unable to, obtain a mortgage. If you wish to apply for rented housing, you can do so by visiting Homefinder Somerset. The New Kier Development is well under way, the builders are on course to finish in December 2011. Work has begun on the new East Huntspill Housing Development at Hackness Farm. To celebrate, the Society, in partnership with Sedgemoor District Council and East Huntspill Parish Council, Somerset County Council and the Society's contractor Kier Living, held a special turf cutting ceremony at the site on the 25th May, and thereby marked the start of the project to build 12 affordable homes for local people. Part of the scheme involves creating a wetland pond area alongside the new public footpath. As well as providing water storage for periods of heavy rainfall, the new pond will be a haven for wildlife. Cllr Andrew Gilling, Sedgemoor District Council's portfolio officer for housing and ward member for East Huntspill, was on hand to make the first cut for the new pond, helped by Anne Robinson, the chair of South Western Housing Society, which has been working with the parish, the district council and Somerset County Council over the last two years to bring this scheme forward. Anne Robinson said: "On beh alf of South Western Housing Society, I am very happy to be taking the first step in building these new affordable homes in East Huntspill where, as with our other developments, we will be giving priority to housing those people who have a strong local connection to the area. We are pleased that the Society's strategy to develop affordable homes in rural areas has facilitated this development and we hope to carry on with other examples like this in the south-west." Cllr Gilling said: "We are delighted that by working with South Western Housing Society, we are able to provide high quality affordable housing for local people and we are pleased that the design has incorporated something that the whole village can enjoy in the shape of the wetland area."